This wine is sourced from 2 acres of Nebbiolo planted in the ‘Z Block’ at Bien Nacido Vineyard in 1994 under Jim Clendenen’s direction. The site is cool, breezy, and on a hillside where the soil is gravelly and shallow—all contributing to the intensity of the fruit. 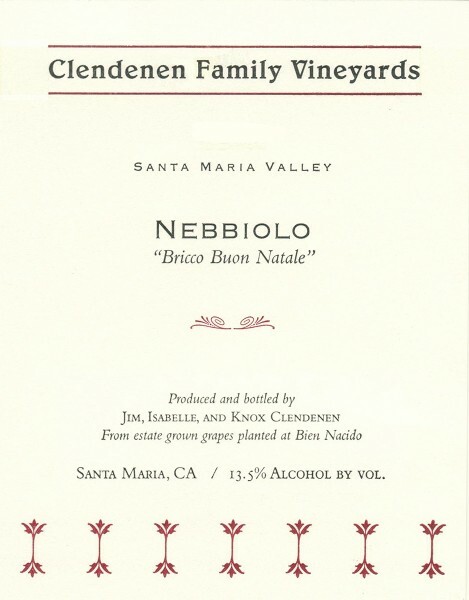 The two best clones of Nebbiolo were planted, Lampia and Michet, which have forked canes. These plantings were originally part of an Italian varietal project that Jim had called Il Podere. Nebbiolo is carefully hand picked and sorted in the vineyard. All the grapes are destemmed and fermented in 5 ton open top fermenters. The must is punched down at least twice a day and pressed at dryness. The wine is then racked into 500L Hungarian oak puncheons, one third of these are new, and racked once a year. This cuvee is aged a minimum of 5 years. After this time in barrel the wine is very clear, due to low pH and the long time in barrel. No filtering or fining is necessary at bottling.